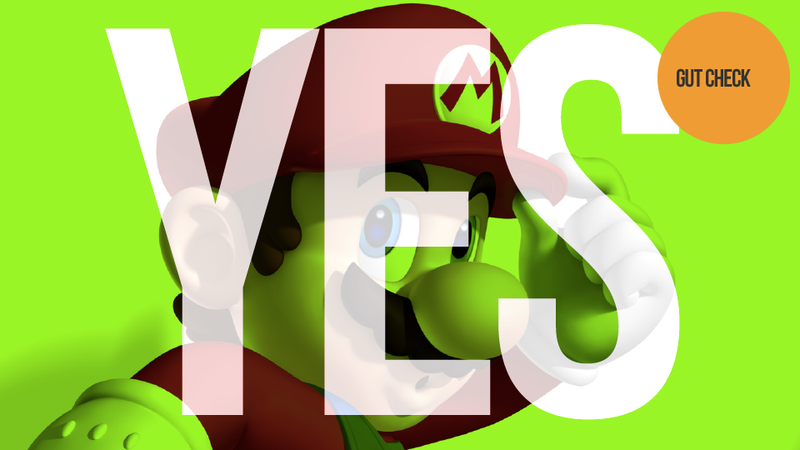 Should You Buy Super Mario 3D Land? Yes. Eight months after the 3DS' North American debut, Mario at last debuts on the handheld in Super Mario 3D Land. Nintendo is keen for a big hit to energize interest in the device, and they've put their best plumber on the job. Should you hire his services too? Owen Good, the Sports Guy Who Went Through a Warp Pipe and Ended Up in World 4-2: For starters, this is a fun game. That's what this is supposed to be, and Super Mario 3D Land answers the demand the way Nintendo always does, with charm, variety, and a toymaker's ingenuity that gives us things like gyrometer operated binoculars. It also makes the best use of the 3DS's three-dimensional capabilities I've seen yet. The 3DS is at its most mesmerizing when you feel like you're looking through a glass-bottomed boat into another landscape, and that is what 3D Land feels like to me. The perspective changes are a real delight, switching from a diagonal camera, to straight overhead, to side-scrolling, and serve their environments well. It's an extremely good looking game. Whether this is cause enough to buy a 3DS is another question we're not answering here. Those who have one should definitely pick it up because hey, it's-a he, Mario. Yes. Stephen Totilo, who usually doesn't have time to answer obvious questions: It's made by people who made the fantastic Super Mario Galaxy games and, before that, the impeccable drum-controlled side-scroller Donkey Kong: Jungle Beat. It has the best 3D effects on the system, none of which hurt my eyes at 75% or even 100% 3D slider activation. World 5-2 is cool, 5-5 ia gem. 2-3 is winner. So is 3-1 and the one that is partially a giant piano. Also: the airship levels and so many more. The levels are short enough to play through between bus stops or commercial breaks and the whole package is more fun than most 99 cent portable games I've ever encountered. Enemies of fun—or people who wouldn't spend the price of an above-average dinner on a handheld game—would hate Super Mario 3D Land. I'm not one of them. Bonus: it's not as simplistic (dare I say "dull"?) in level design as New Super Mario Bros. DS. Should you buy it? Yes. Joel Johnson, who has touched nary a jump of Super Mario 3D Land. It's pretty simple: if you already own a 3DS, you're starving for quality first-party titles. And while I may have my doubts about where Nintendo is going as a company, I've little doubt about their ability to make a Super Mario title—even the duds like Sunshine have had enough great moments and clever design to merit the experience. Is it worth buying a 3DS for, though? Hard to say—especially not for a Gut Check. Thankfully, that's not what my gut is being asked to divine, so I'm off the hook on that one. Yes. Gut Check is an off-the-cuff impression of what we think of a game: what we'd tell a friend; how we'd respond on Twitter or Facebook or over a beer if someone asked us "Would you buy this game?" Our lead writer, who has played a lot of the game, decides. Other writers chime in for additional points of view. Stay tuned for our full review.